Tarte Cosmetics 30% off Friends And Family Sale! Tarte Friends & Family 30% off sale? Step away from the blush and nobody gets hurt! If you’re a bona-fide Tartlette you understand full well my excitement at the 30% off Friends and Family sale Tarte Cosmetics has going on at their website. And even if you’re not a Tartlette yet, now is a great time to initiate yourself into the cosmetic awesomeness that Tarte. Use the code FFAUG through August 8, 2012. Here are my recommended picks to haul during the sale. 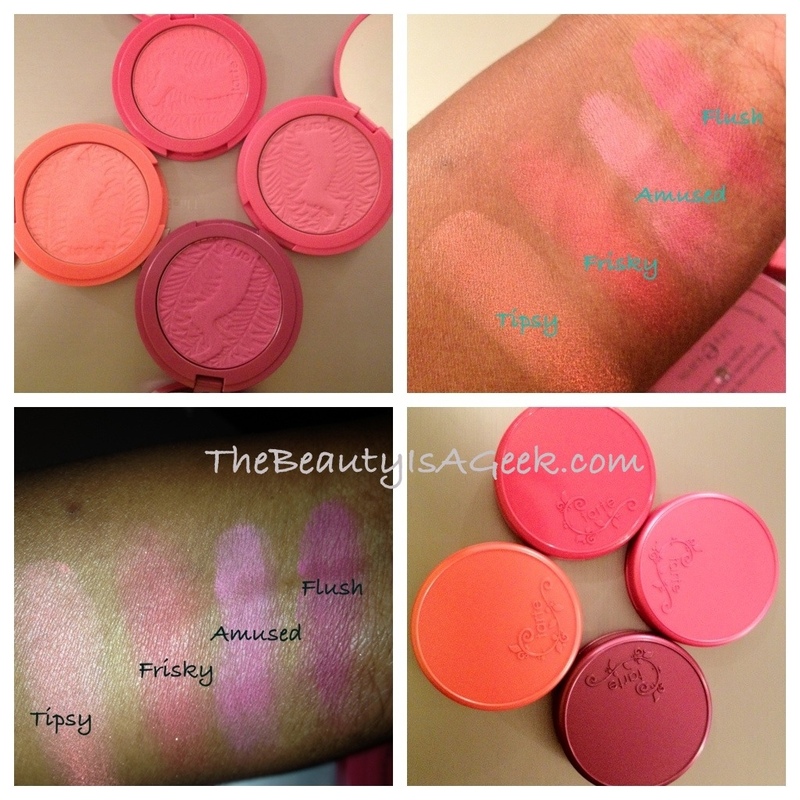 Blushaholics can’t truly call themselves one unless they own one of these amazing blushes. Made with Amazonian clay, they are moisturizing to dry skin yet oil-resistant enough to withstand even my OPEC-threatening oily skin. These blushes are very pigmented and you need very little to start with and the coverage is buildable. For those with dark skin, be wary of the very light shades as while the color does build up, fair shades will look ashy on dark skin. My favorite blush colors (and the ones I own) are Frisky, Tipsy, Amused and Flush. I’ve tested these in the hot Florida heat and while there was some fading of the color at about 4 – 5 hours, a quick re-touch with a little product brought it back to life. Swatches of my beloved Tarte Amazonian Blushes! This foundation is waterproof and is so light on the skin it is a godsend for oily-skinned gals. Unfortunately I returned the color I bought (Deep) as it is made for dark-skinned beauties with yellow undertones, not us red undertoned gals. That aside the foundation performs well, blends effortlessly, is long-wearing and comfortable even on my sensitive acne-prone skin. Hopefully Tarte will make a dark shade with red undertones in the future. If I didn’t already own an obscene amount of MAC fluidlines and YSL gel eyeliners I would so haul some from Tarte. Made with Amazonian clay, these waterproof eyeliners are softer than MAC’s yet a bit stiffer than YSL’s but come in a very wearable range of five (5) shades. A nice bonus is all shades of Tarte’s waterproof eyeliner come with a brush to line and smudge the product on your lids. So what are you hauling from the sale? Got anything you’ve just gotta have? Comment and let everyone know! 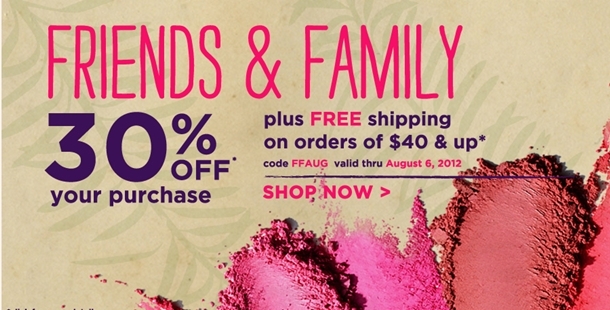 Urban Decay’s Friends and Family Sale: 20% OFF!!! Urban Decay's Spring Friends & Family Sale: 20% OFF! Are you ready to haul some Urban Decay cosmetics at 20% off?!? Ready or not, UrbanDecay.com is offering 20% off almost all regular and sale priced items using the code: FFSPRING12. Only the Urban Decay Naked 2 palette cannot have this discount applied to it. I love how smooth and pigmented these shadow pencils are! The color is easy to build up and the range goes from neutral to full-on trendy. Create a gorgeous eye look even if you’re still a makeup noob. I reviewed this set a few weeks back and absolutely fell in love with it. Currently sale priced at $12, the discount knocks it down to less than $10!! Go get one! This is my 2nd favorite mascara next to Givenchy’s Phenomen’Eyes only because it doesn’t come in a waterproof formula. This mascara is no joke as it quickly builds up and curls your lashes. I have yet to Florida Test it (I will in April) but when I can’t find my Givenchy mascara, I gladly grab this one. With the vastly-improved design and larger size, this is a good deal if you do not have oily to severely oily lids. UrbanDecay.com offers free domestic shipping on all overs $50 or more. The sale ends 3/10/12. Planning to haul from the sale? Share your finds in the Comments!